​Project overview worksheet: Each student received a hard copy during the week of October 22. It MUST be signed by a parent by Monday, November 5, 2018. Also due Monday, November 5, 2018. How does it relate to the theme of "Triumph and Tragedy in History? " 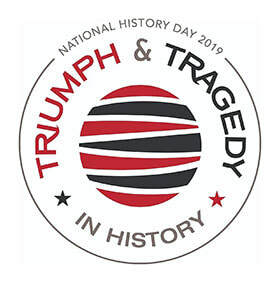 2019 Theme: "Triumph and Tragedy in History"
The theme "Triumph and Tragedy in History" is the theme for the 2019 NHD fair. You need to read over the Theme Narrative (pages 8-9 of the Theme Book) to have a better understanding of the annual theme and the types of topics that relate to the theme. Attached is a list of sample topics that you can choose from. You do not need to pick a topic from the list, but before you decide on a topic not on the list, check with the teacher to make sure it is appropriate.